Indian Prime Minister Narendra Modi has called for making his campaign for a ‘Swacch Bharat’ (Clean India) into a mass movement. A civic group called “Ugly Indian” in Bangalore has been doing a great job for over a year, “spot fixing” the city’s streets with face masks, gloves, buckets, broomsticks and mops. Their mission is now spreading to other cities. Our community here can match the zeal that is sweeping India; our challenges are not as daunting. 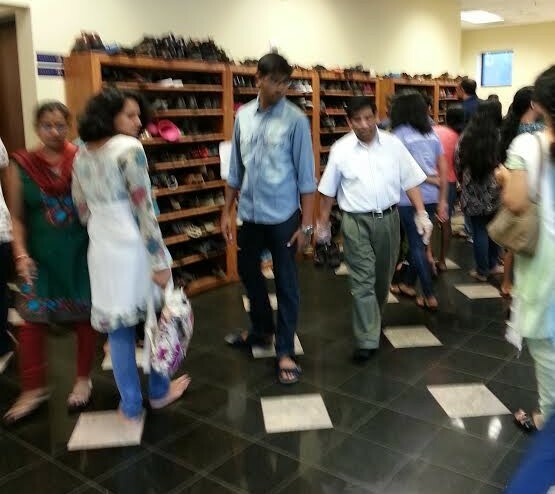 Three days a week, I manage the footwear and rack area in the temples in the Atlanta suburbs in the evening hours when devotees come in large numbers, over 500 at times. Under supervision, 98% of people use the racks. Others are truly sorry when their attention is drawn to the issue. I have for seven years arranged the footwear of my brothers and sisters on the racks or in a single line by a wall. People like to see their temples clean and they appreciate what I do. Many miss my supervision when I do not show up one day to maintain order. 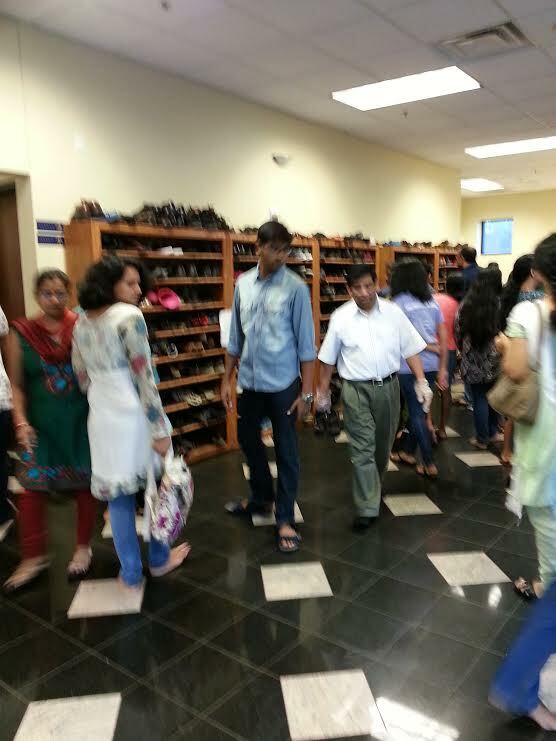 When not supervised, the shoe area a mess and poses a safety hazard of tripping or twisting the ankle. 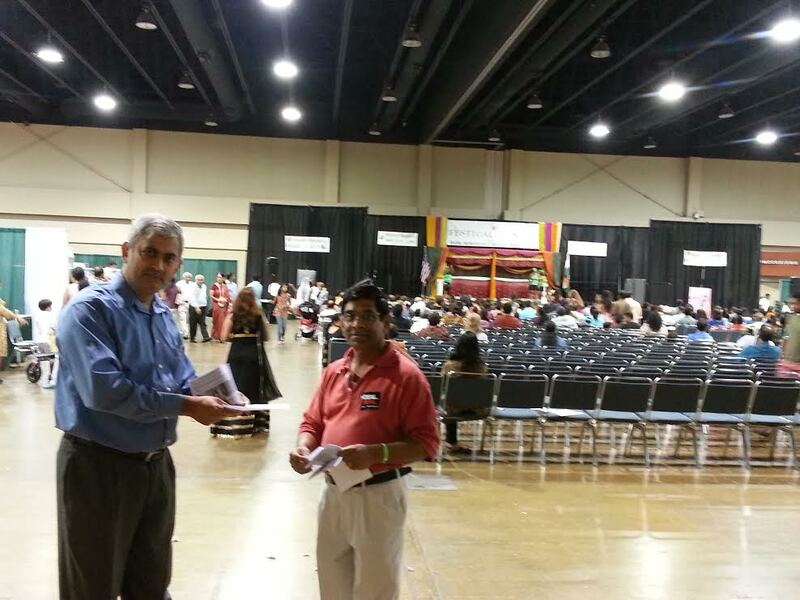 We can keep our temples clean without supervision if we promote awareness. If each of us occasionally promote the ‘Swacch Devalaya’ (Clean Temple) campaign on Facebook or Twitter and share other relevant messages, we can create a ripple first, then a wave and ultimately a tsunami of awareness to keep temples clean. Does it cost us any money or more than a minute of our precious time? If water is not available in the temple to cleanse our hand, we can help ourselves by bringing with us a sanitizer gel or we can use a tissue to hold the footwear. We can be creative in this regard. Washing our hands seems to be an issue for less than 15% of the people. Also when attending sathsangh at homes where hands can be washed, few people take the trouble to place footwear neatly along the walls. It is mostly all over the place in the garage or near the doors or piled up in the foyer. Our spiritual masters who are showing us the way to evolve and enriching us with their teachings can promote awareness in this area. Nonprofit institutions can also play an invaluable role. We have to come out of our shackles of apathy and indifference. A few individuals cannot move a blade of grass, we need to make this a mass campaign. Cleanliness is the talk of the town in India and PM Narendra Modi is at the zenith of his popularity not only in India but among all of us. Let us seize the moment and launch the campaign of promoting awareness for a Swacch Devalaya, or Clean Temple.